SAN FRANCISCO, CA--(Marketwired - May 20, 2015) - PRO Unlimited, Inc., a pioneer and global leader of contingent workforce management solutions, announced the availability of Wand® Wearable for the Apple Watch, the latest release for the Wand VMS platform. "We're very excited to be one of the earliest B2B apps on the Apple Watch," said Andrew Schultz, PRO's CEO and president. "With Wand Wearable for the Apple Watch, we extend the scope of our omnichannel user experience even further." "Our clients have fast-paced, demanding environments that require faster decision making and execution," said Ted Sergott, senior vice president of Product Development at PRO. "Wand Wearable allows managers to perform timely business transactions from virtually anywhere. For example, rather than waiting until the end of an important meeting, a vice president of IT with high-end knowledge workers can receive time card and expense notifications on her Apple Watch, and with two taps on her watch approve time and expenses for all of her contingent workers in a matter of a few seconds." 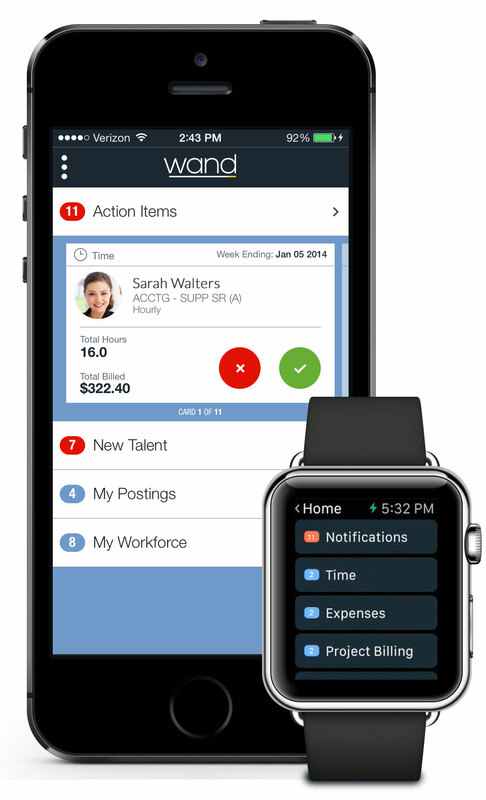 Organizations seeking to find out more about Wand Wearable for the Apple Watch -- or the Wand enterprise suite of products -- can request a virtual demo from the PRO team. Request a Wand Demo today. About PRO Unlimited: PRO Unlimited offers purely vendor-neutral Managed Service Provider (MSP) and Vendor Management System (VMS) solutions for the e-procurement and management of contingent labor, 1099 and co-employment risk management, and third-party payroll for client-sourced contract talent. Managers who are on the go now have the ability to receive notifications of upcoming interviews and add those to their iOS calendar, review and approve time cards and expenses, and manage and approve changes in SOW projects.